Stories by Heart Is Masterful. His wide ranging talent is on display at Roundabout’s American Airlines Theater where his one-man play, Stories by Heart is up until March 4. A small part of the show is about his father, Arthur Lithgow who was an actor, director, artistic director and founder of various theater groups mainly in the Midwest. He founded the Great Lakes Shakespeare Festival (which continues to this day), worked with a group of actors who became well known, but always managed to have it end in disaster – feuds with boards of directors, financial difficulties, and more. But the family would pull up stakes, move on and start over. Yet Stories by Heart is really Lithgow presenting two short stories to us. The first is by Ring Lardner, “Haircut.” It is essential the thoughts and words of a small town barber, circa 1925 talking to his customer who sits silently in the chair. With no props, Lithgow recreates the old-time barbershop experience from the hot towels, to the stropping of the blade, the lather and more. He even creates wonderful sound effects. But the story which begins as a pleasant tale of small town America and one of the men of the town, slowly turns into something more. Before our eyes, we begin to realize that while the barber tells the story of this man who liked to play practical and cruel jokes on women and weaker men, rather than feeling disgust at his antics, sees nothing wrong in them. It becoming chilling to realize that he is complicit in the casual cruelty. 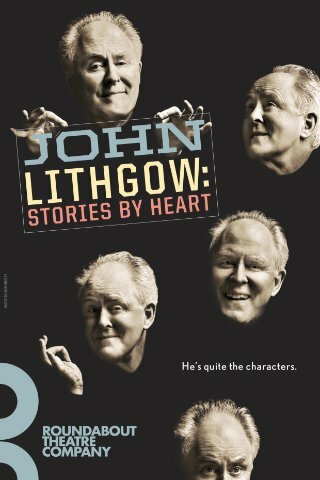 Lithgow gets it all right – the body language, the accent and more. He seems transformed; I began to picture him as this round-faced, medium sized, bald man with the white jacket. That takes talent. 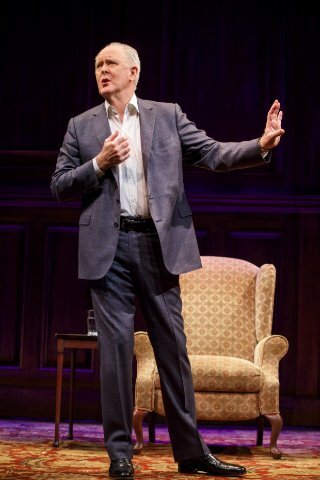 In the second half, he talks about his father’s last years and how, when his father was recovering from surgery and seemed to have given up, Lithgow stayed with his parents for several months, caring for them. He tells of finding the thick book of short stories from which his father had read to him and siblings, and his decision to reverse it: he would read to his parents. It was with delight that he found parents chose the same light story that he and his siblings had loved: P. G. Wodehouse’s “Uncle Fred Flits By”. This silly comic story about a man whose uncle (Fred) always gets them into various pickles is a laugh fest. Here Lithgow gives us multiple characters from Uncle Fred, to the nephew, to the nephew’s friend and others. Again he is marvelous. He does so much with his voice, eyes, gestures and posture. We see the characters and laugh at the ridiculous situations they find themselves in, all due to Uncle Fred. This two hour production is a delight for anyone who enjoys seeing talented actors demonstrate their skills. For tickets, visit Roundabout Theatre.